At Growcode, we’ve worked with hundreds of online stores on ecommerce optimization. That’s how this in-depth, 115-point ecommerce optimization checklist came about. By the end of it, you’ll have a thorough understanding of all the on-site elements you need to optimize and how to do it. We’ve designed this guide to be used in three ways. There’s a lot of content, so it’s advisable not to try and digest it all at once. Whatever your needs, an incremental approach will likely work best. As a tool for comprehensively evaluating your online store or new site design. As a source of optimization ideas if your current strategy is stalling. As an aid for brainstorming solutions to specific problems, like cart abandonment for a particular product or category. If you’ve already identified a problem, just jump to the appropriate checklist and go from there. It’s structured in a top-down way, beginning with a general ecommerce optimization checklist that’s applicable to all areas of your site before moving onto checklists for specific types of pages. Where appropriate, we’ve also elaborated on checklist points. We’ve included more information in the “general” section because these changes tend to lead to the biggest conversions. 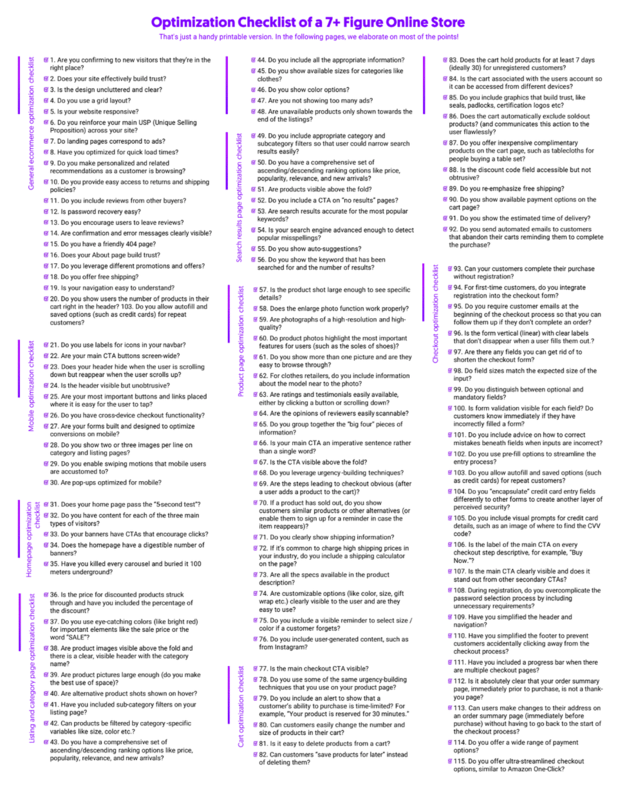 Handy dandy printable version of the whole 115-points Ecommerce Optimization Checklist. Click here to get the full, pdf version. Are you confirming to new visitors that they’re in the right place? Does your site effectively build trust? Is the design uncluttered and clear? Do you use a grid layout? Do ou reinforce your main USP (Unique Selling Proposition) across your site? Do landing pages correspond to ads? Have you optimized for quick load times? Do you make personalized and related recommendations as a customer is browsing? Do you provide easy access to returns and shipping policies? Do you include reviews from other buyers? Do you encourage users to leave reviews? Are confirmation and error messages clearly visible? Do you have a friendly 404 page? Does your About page build trust? Do you leverage different promotions and offers? Do you show users the number of products in their cart right in the header? 1. Are you confirming to new visitors that they’re in the right place? When new visitors land on your site, they have a specific set of questions. Your first job is to gauge whether or not they are being answered as quickly as possible. Will I find what I’m looking for here? Visitors want to know they’re in the right place. Will they find the products they want to buy? Is it clear that your store sells women’s clothes and not refurbished laptops? Why should I shop here and not somebody else? This concern can be remedied by providing a clear USP, both on your home page and product pages. Do you offer the best price? Are lines exclusive to your store? Do you offer same-day delivery? What do I do next? Visitors want a clear CTA so make sure you include one. 2. Does your site effectively build trust? Anybody that comes to a site for the first time instantly takes in dozens of micro-impressions, all of which contribute to an opinion about trustworthiness. b. Number of customers or clients that you have. c. Number of reviews (especially important during product pages optimization). d. Years on the market (for example, “Established in 1985”). f. Phone number and contact information. Note the multiple trust signals including HTTPS protocol, the green padlock for extended validation certification, the “secure” subdomain for checkout, and the prominantly placed Comodo security badge. Not all of these will be appropriate for every page. But it’s important to bolster trust by including at least some. 3. Is the design uncluttered and clear? Sites that “breathe” usually convert significantly better than those that are cluttered and difficult to navigate. Apple is renowned for using original, minimal designs, beautiful photography and clear, informative descriptions. 4. Do you use a grid layout? At Growcode, we could talk for hours about grids. 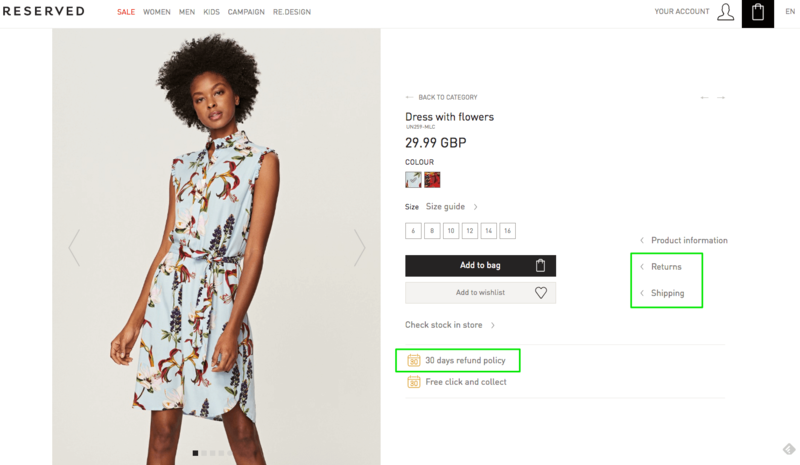 They’re one of the oldest elements of design and uniquely important for online retailers. Following a grid system will make every online store beautiful. 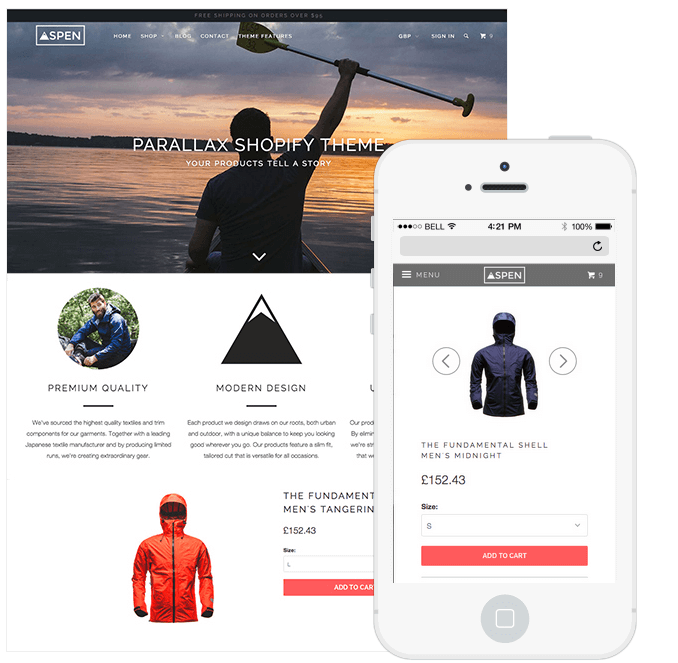 It sounds like a simple thing, but you’d be surprised how many ecommerce site designers overlook it. 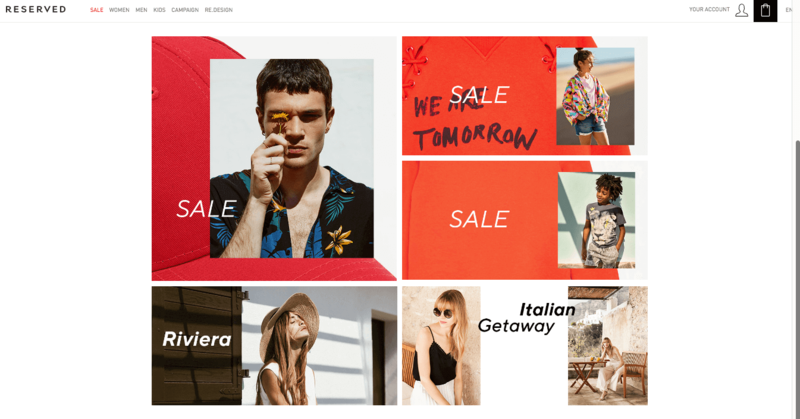 Grid-based layouts are one of the most popular designs in ecommerce. Following a grid system will make every online store beautiful and likeable. Reserved knows it very well. Responsiveness refers to how well a site adapts to different browser sizes and devices. There are literally hundreds of devices and browsers, so it’s crucial that your site is designed to render well on all of them. In the US, sales made on mobile devices accounted for 34.5% of all ecommerce sales in 2017. And that number is only expected to get bigger. Parralax created great responsive website, which works perfectly on desktop and mobile. 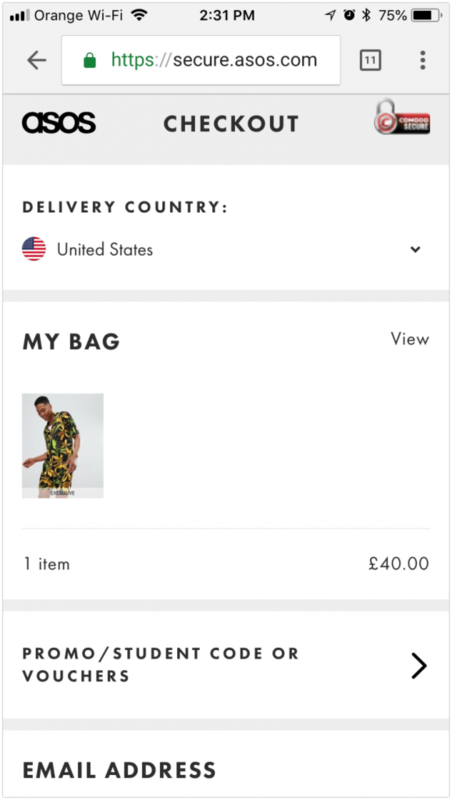 Responsive version is the first step if you want to improve your mobile checkout. Source. 6. Do ou reinforce your main USP (Unique Selling Proposition) across your site? We’ve mentioned the importance of highlighting USP on your pages, but do you reinforce your main USP across your whole site? By “bombarding” customers with your most persuasive USP, they’ll form a clear connection between your store and the key benefits you offer. If you offer free shipping on the majority of your products, shout it out on every page! We encouraged one of our clients to showcase the following slogan: “If you don’t get your product in 24 hours, we’ll pay for the shipping!”. Needless to say, conversions increased. 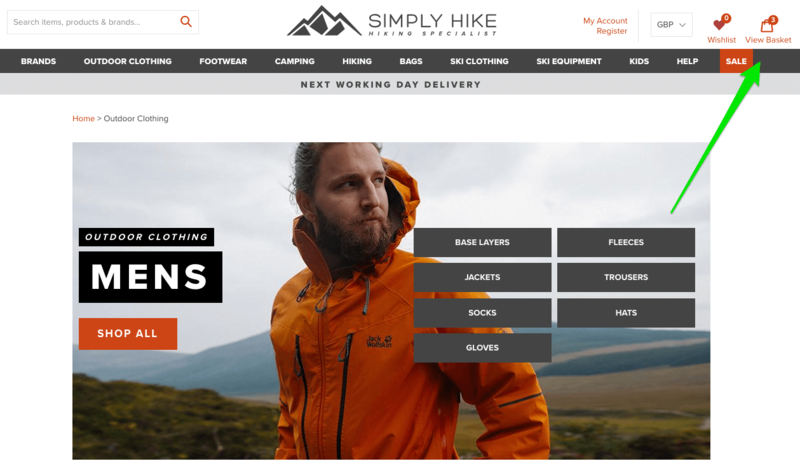 Simply Hike communicates next day delivery on every page so the customer can be encouraged to buy on every step of the purchasing process. By “bombarding” customers with your most persuasive USP and ecommerce value proposition, they’ll form a clear connection between your store and the key benefits you offer. 7. Do landing pages correspond to ads? Have you ever clicked on an ad only to land on a page that’s totally unrelated to what you were offered? It’s an incredibly frustrating feeling. Ensure that all of your landing pages link up with your ads. And we’re not just talking about corresponding headers and page copy. The whole look-and-feel should reassure visitors they’re in the right place. After clickinig Daniel Wellington add about women watches we land on a category of women watches. Free shipping which is outlined in the add also appears here. Ensure that all of your landing pages link up with your ads. 8. Have you optimized for quick load times? Slow loading pages can hurt SEO rankings and ecommerce bounce rates (the number of visitors that leave your site after visiting only one page). Improving page-load times can often have a dramatic effect on conversions. All of these small tips can add up to reduce load times by fractions of a second. And in the online game, that’s all you need! Slow loading pages can hurt SEO rankings and increase bounce rates. Improving page-load times can often have a dramatic effect on conversions. 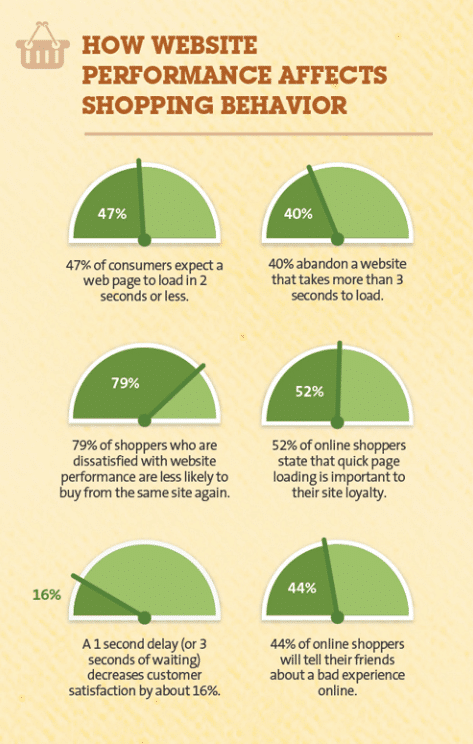 Graphic shows how website performance affects shopping behaviour. Source. 9. Do you make personalized and related recommendations as a customer is browsing? 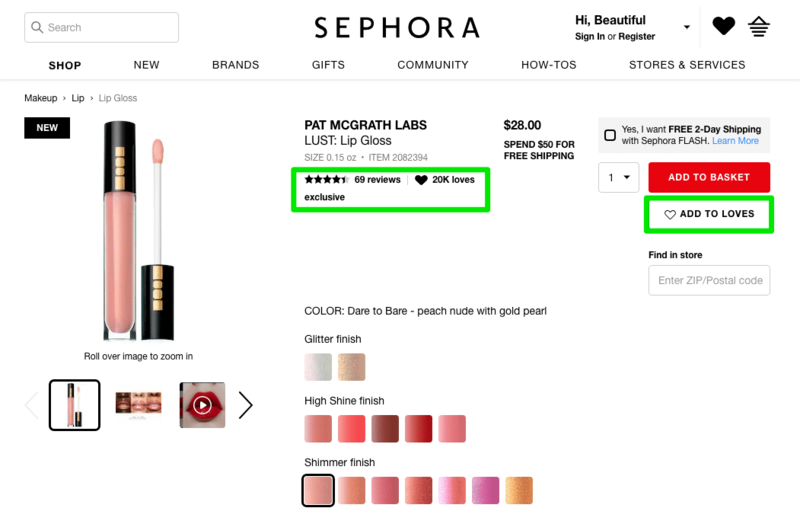 Are you making personalized product recommendations as a customer is browsing? When they land on a product page, do you include personalized suggestions? What about on a category page? 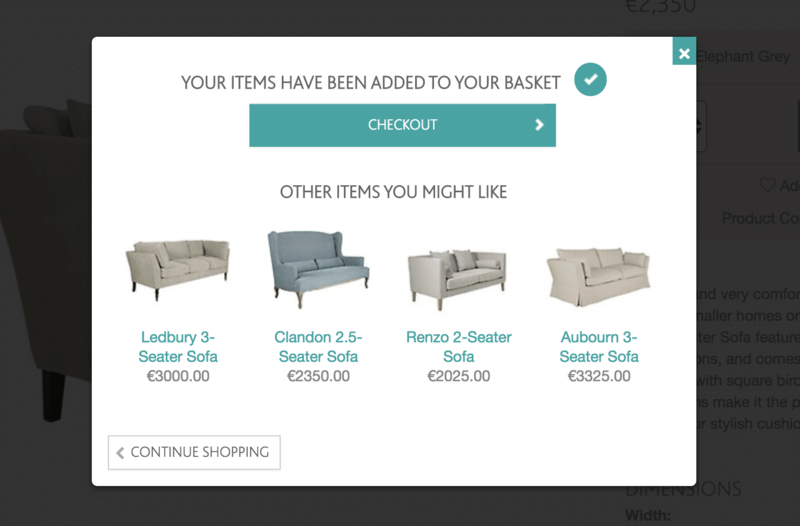 Oka Furniture gives recommendations after adding something to cart. It allows shoppers to explore new products that they might also want to buy. Source. 10. Do you provide easy access to returns and shipping policies? How easy is it for a customer to check shipping policies or confirm that they’re able to make returns. These are two of the primary concerns that visitors have. Make it easy for them to find answers quickly. On every product page on Reserved you will find return and shipping policy. It is easy for a customer to check shipping policies or confirm that they’re able to make returns. They don’t need to search for it. 11. Do you include reviews from other buyers? Testimonials are one of the easiest ways to build trust with new customers. Are you including them prominently on product pages and alongside or underneath product listings on category pages? Are they both about your online store and particular products? Testimonials are one of the easiest ways to build trust with new customers. 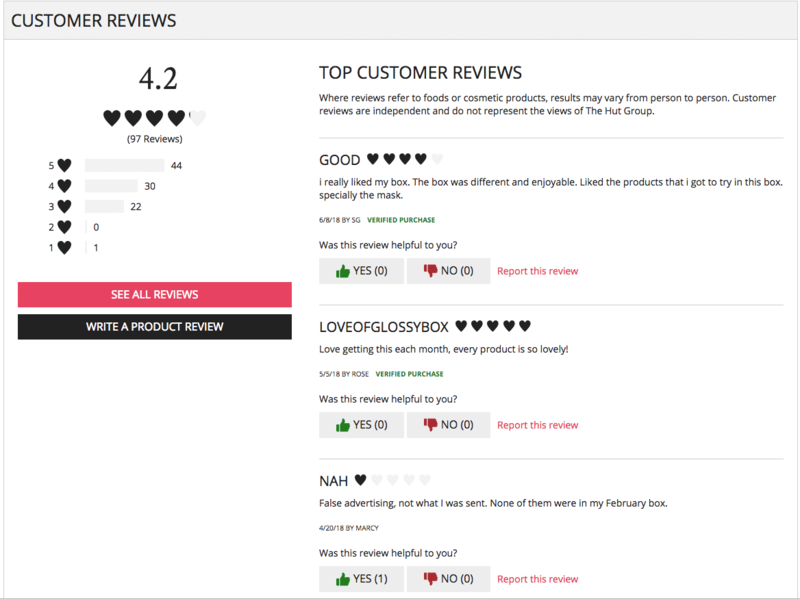 Glossybox have a group of devoted customers who every month are leaving reviews so it can help potential customers to make a decision about buying the product. 12. Is password recovery easy? Always include a password recovery option on login pages. Something like, “Have you forgotten your password?” is all that’s needed. Simply Hike created very simple password recovery option so it is as much easy as possible. “Forgot your password?” is just enough to make it clear for the customers what to do when forgetting their password. 13. Do you encourage users to leave reviews? Reviews are useful for building engagement with existing customers as well as trust with potential ones. By encouraging customers to leave reviews on your site, either after checkout (find out how to optimize checkout funnel) or on return visits, you will create a solid collection of positive testimonials whilst also fostering engagement. Reviews are useful for building engagement with existing customers as well as trust with potential ones. Seeing other giving reviews encourages to leave a review after shopping to feel as a part of comunity. On Sephora’s product page reviews are hard to miss. 14. Are confirmation and error messages clearly visible? Clear confirmation pages are about fostering satisfaction with your customers. By removing any doubt that their purchase has been successful (and is on its way), they will associate your brand with ease. Error pages and messages are equally important for boosting conversions because they let the user know when they need to take another action. If your error messages are ambiguous, then users may assume that they have achieved their desired outcome or they are unable to get what they want (such as a product is out of stock). Let users know something is wrong and be clear about what they need to do. 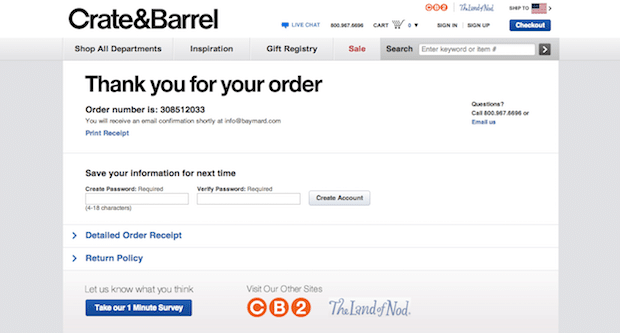 Crate&Barrel created simple “thank you page” where they comunicate a confirmation of the order. By removing any doubt that their purchase has been successful (and is on its way), they will associate your brand with ease. 15. Do you have a friendly 404 page? By being friendly (making a joke or saying something nice) you can overcome the tendency on the part of customers to close your tab in their browser. They’ll be more inclined to give you a second chance. Whenever a visitor lands on a 404 page, their “customer journey” has been interrupted, often leading to annoyance and frustration. 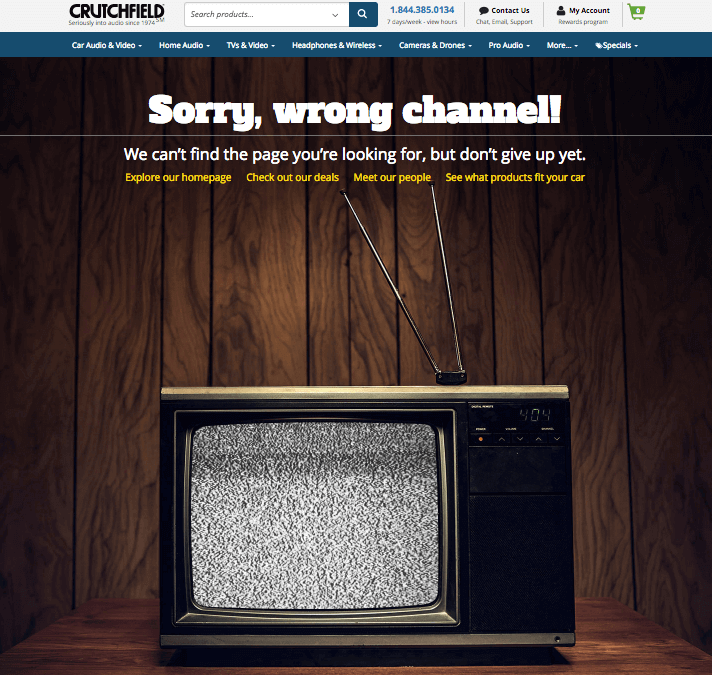 Crutchfield came up with funny idea to present the 404 page. Thanks to that customers should be more inclined to give you a second chance. 16. Does your About page build trust? Whenever a visitor lands on your about page, you have an excellent opportunity to build trust and engagement. “About” page should build trust and show values of a company. Showing faces and their story behind the brand, just like MVMT does, is also a good idea. 17. Do you leverage different promotions and offers? It’s important to showcase promotions and offers on your site, but are you offering a number of different promotions to appeal to different segments of your customer base? Tbdress shows the specific number of pieces available for its flash sale. This approach overcomes the knee-jerk reaction from customers of, “Oh, just another sale!” whilst also taking advantage of fear-of-missing out. 18. Do you offer free shipping? Free shipping is one of the most important considerations for customers when purchasing online. If it’s viable for you to offer free shopping and you don’t, then it’s something you should seriously consider. 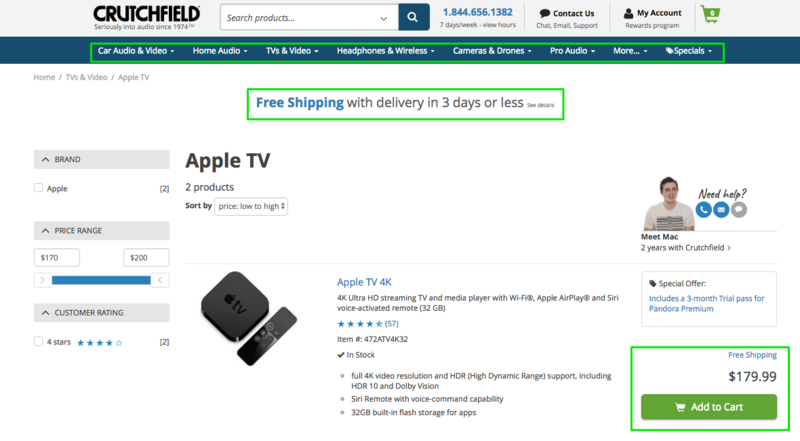 In the example above, HP adds “Free Shipping” alongside the promotion. 19. Is your navigation easy to understand? Navigation should follow a simple, hierarchical structure and utilize categories that most customers will recognize. Navigation should follow a simple, hierarchical structure and utilize categories that most customers will recognize. Zalando is showing in several places in which category customer currently is. 20. 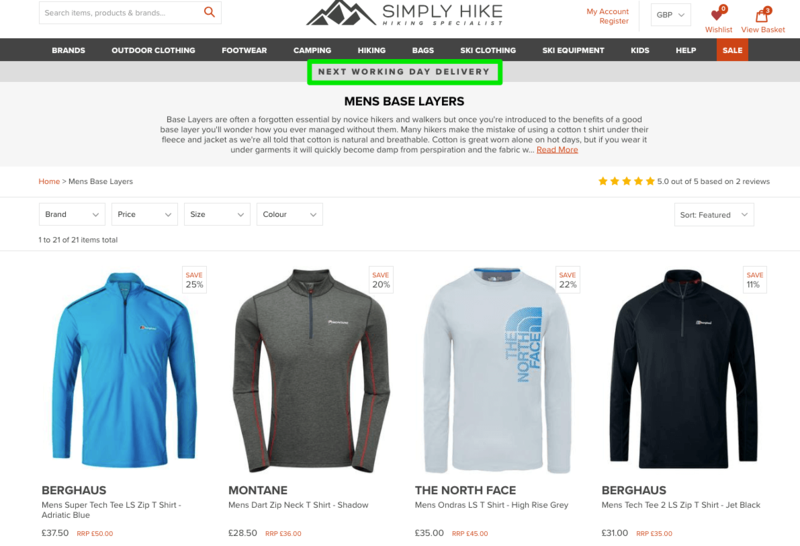 Do you show users the number of products in their cart right in the header? Showing the number of products in a customer’s cart ensures they can keep track of their purchases and makes them aware that they’ve put something into the cart. Simply Hike uses this technique to allow customers to track their purchases and makes them aware that they’ve put something into the cart. Hungry for the rest of 115-elements of the checklist? 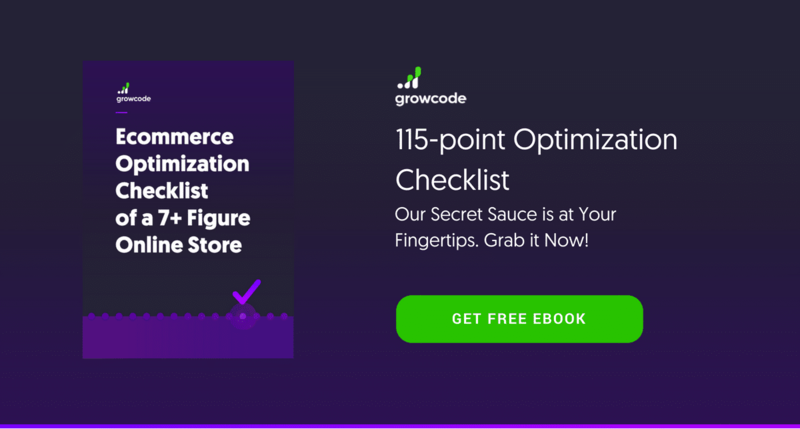 Get the complete, free copy of the ebook: Ecommerce Optimization Checklist of a 7+ Figure Online Store. Our secret sauce is at your fingertips. No time to lose, grab it now!